Ok, I’ll admit it….in the past, soups haven’t really been my ‘thing’. So when my mum asked me to make a soup for a dinner party of hers, it sent me into a mini-panic. If she had asked me to make literally anything else, I’d have done so with confidence….but soups? As simple as they are, they are my weakest link. So with the cold weather fast approaching, I have made it my mission to perfect a whole arsenal of them and I am determined to conquer the soup world by the end of the winter!…which gets me thinking, is there such a world?? So first off in my soup repertoire is super simple, yet bursting with flavour. I tried something new and made this soup entirely in the oven, not on the hob, so there is much less ‘fussing’ to do. It was great to be able to leave it to do its thing without constantly stirring and checking on it. 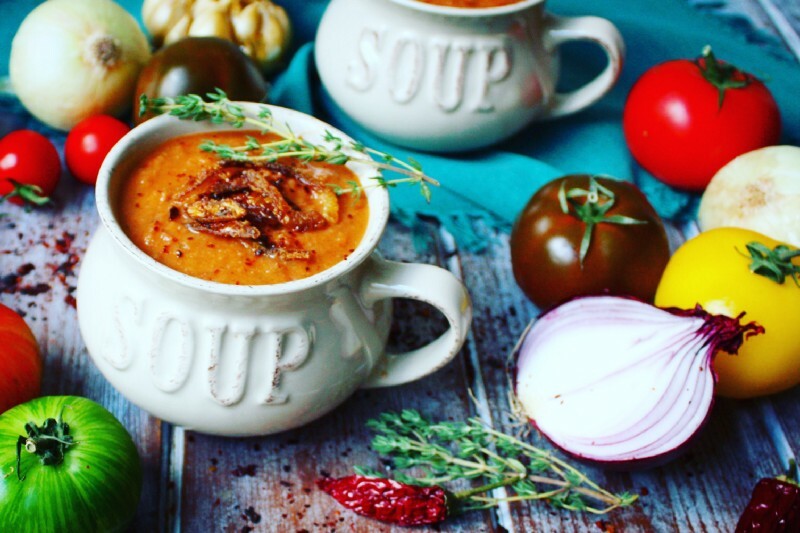 The intense flavour of the thyme roasted onions, garlic and tomatoes make a deliciously tasty and easy soup. And then, for an additional wow factor, I made crispy tobacco onions to sprinkle on the top. This of course is entirely optional, but be warned! They are so insanely moreish that you might want to make double so that there is actually some left for garnishing! · Preheat the oven to 180°C. · Peel the onions and slice them into quarters. · Slice the top quarter off the garlic bulb. · Place the onions, garlic bulbs and thyme in a large roasting tin. · Roast for 15 minutes before adding the tomatoes. · Roast for another 20 minutes, or until both the tomatoes and the onions are tender. · (Optional — start to make the crispy onions as per the instructions below). · Remove the thyme stalks and using a tea-towel, squeeze the roasted garlic cloves out of the bulb. They should pop right out with a gentle squeeze. · Pour the vegetable stock over the onions, garlic and tomatoes. · Add the balsamic vinegar and smoked paprika and return to the oven for another 20 minutes. · Carefully ladle the soup into a high speed blender, and blitz until smooth. · Decorate with the crispy onions and serve immediately. · Pell, halve and slice the onions as thinly as possible. · Place them in a bowl and sprinkle with salt. · Toss the onions, separating the pieces as you go. · Allow the onions to sit for 2 minutes. · Toss the onion slices in the flour, pressing the flour into them so they are fully coated. · Heat the oil in a deep frying pan. · Deep-fry the onions, a few slices at a time, for 3 to 4 minutes, until golden brown. Drain on kitchen paper and set aside ready to sprinkle on the soup when it’s ready.